All my mosaics are hand cut and assembled. I prefer to use travertine or marble. It is possible to use porcelain and granite as well but they are harder and take more time to cut. Some are set with mortar to hardibacker and have been installed inside 4 pieces of travertine. These can be hung on the wall or used in a new or existing tile installation. 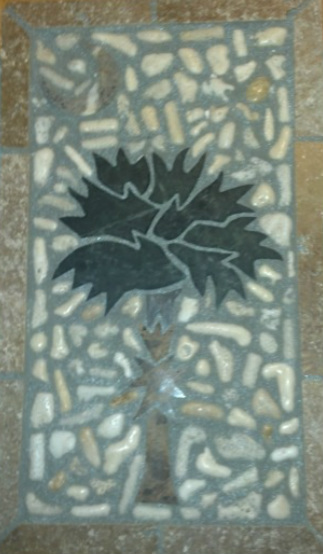 Some are ungrouted and can be installed inside a new tile installation. Most of these murals have a finished dimension of 12x12" but can be made larger or smaller. Custom murals are encouraged of any size, color and subject matter! 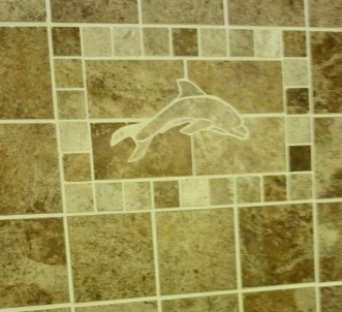 This dolphin was designed and cut on site to add a beach theme to this vacation home. The field tile was a porcelain that resembles travertine and the dolphin was made out of a lighter colored porcelain. This turtle was made with marble and was installed inside ripped down field tile. Emperador marble was used to construct a summer flounder. The model for this design was a picture from a delicous 15" flattie I had cought in cherry grove. My first attempt at the popular state flag. Made with Green and brown marble, surrounded with coral and beach stones and framed with travertine. Inspired by a trip to Florida, this sea cow was constructed with 3 types of gray marble. 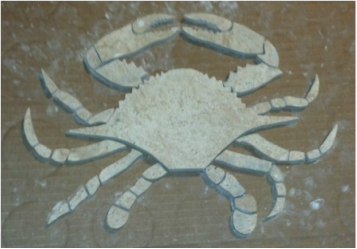 A picture of a blue crab was used to model this mosaic. It was constructed with about 40 pieces of marble. 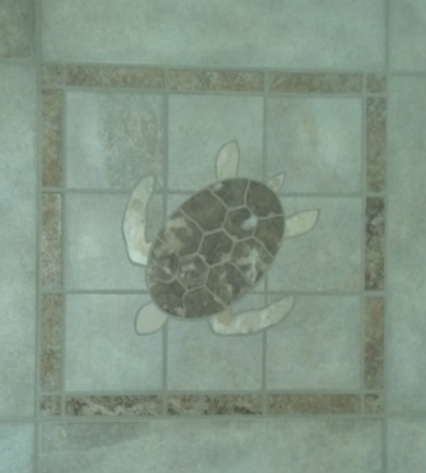 This turtle is constucted of 2 types of marble scribed inside 4 pieces of honed and filled travertine. A picture of a river cooter was used as a guide for this mosaic. Field tile was provided by the customer. Every cut piece was face mounted with mesh and was delivered to customer for installation. Dolphin Mosaic on a tub wall with travertine glass and marble.